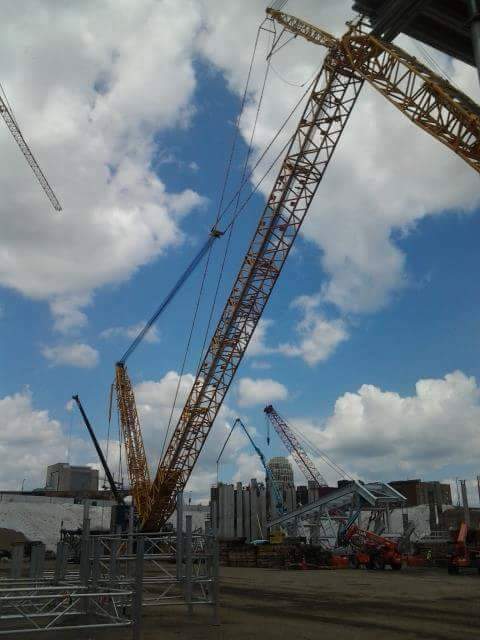 These are just some of the things that Lowanda had to overcome to build your stadium, the new Vikings stadium. Lowanda is an amazing woman. Let’s venture into her world, let’s become her, to see if we could have made it. They headed to a homeless shelter; not knowing what she would encounter. They lived among rats and roaches. When she would try to cook; roaches would crawl out of the refrigerator and stove. When they woke up in the morning and turned on the light, roaches would scatter. Some of us would have given up right there, but instead of giving up Lowanda acted on an ad she heard on the radio. She decided to go to an information session at Summit Academy. It was here where she learned about an opportunity for a woman to do a “man’s job.” She had to prove to herself and her kids that she no longer “needed” a man and she was going to finally make it on her own. 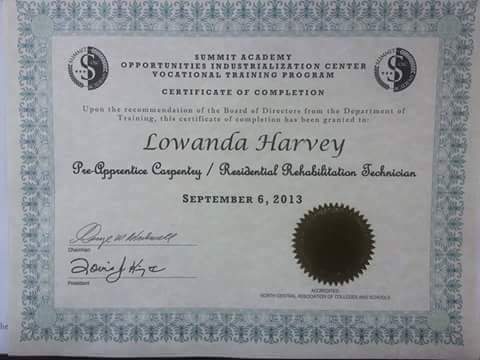 Lowanda was intrigued with Summit Academy because they weren’t scared off by her situation. She needed a place that had an open door policy if she was going to be successful. 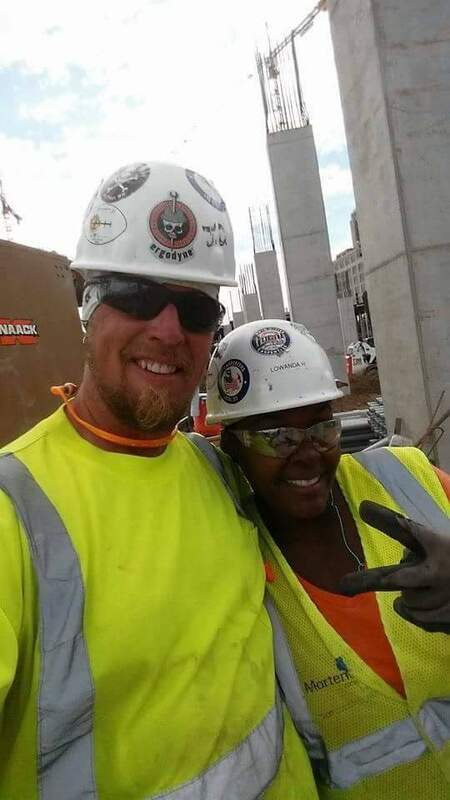 She enrolled in their 20 week construction program while her children were in school. It is an 8 hour a day program and it requires a passing grade of 80% or higher. 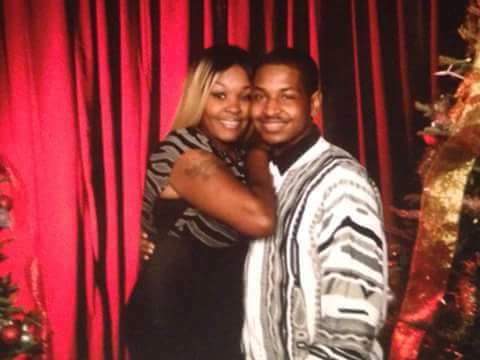 Lowanda received all A’s while living in the shelter and raising her 7 children. 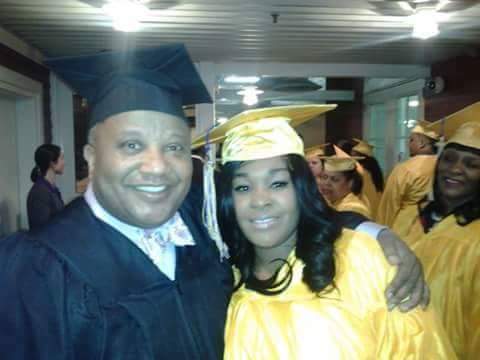 With everything she was going through she still was able to focus on 10 weeks of classroom instruction, including math, Occupational Safety and Health Administration (OSHA), blueprints, power tools, and more. The second 10 weeks was hands on training. She tore down and rebuilt houses and garages. She also did cabinetry and worked on an Indian reservation. She amazed herself. She always thought of herself of “just a pretty girl.” In fact her nickname is “Hollywood” and she is originally from California. She learned that she was capable of a lot more. She was definitely out of her comfort zone and she didn’t know if she would make it, but she had to try for her children. She knew she was never going through abuse again. Upon graduation, Lowanda received an 80K a year job offer in project management, she turned it down. She still wasn’t sure of herself. She didn’t want to fail. Before you’re too hard on her, remember she is just getting out of an abusive relationship and has 7 kids to care for. Instead, she took a job at Tradesman International to gain more experience. She did gain more experience and the company provided the tools that she needed. 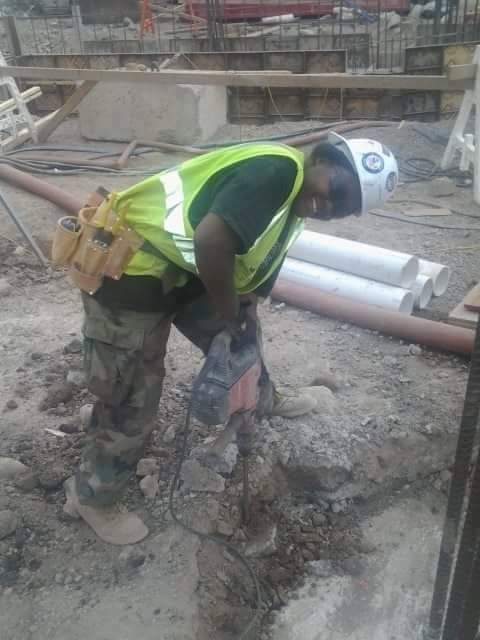 She received residential and commercial training and participated in steel cutting, painting, bathroom remodeling, and worked on multi-million dollar high-end luxury condos. On one project, she had to leave home at 6pm to catch the last city bus. This was 4 hours prior to her shift start time. She would return home shortly before having to see the kids off to school. Her schedule created resentment in some of the children. They understood mom had to work, but didn’t understand why she had to work so much. Those of us that are parents we understand that each child has their own needs and how difficult it is to meet those needs and your own. In Lowanda’s situation, everyone had to heal from the abuse and deal with the stress of the transition. Lowanda left the shelter after four months because they couldn’t accommodate her work schedule. She and her kids moved into a three bedroom house in exchange for labor. She didn’t have to pay rent as long as she remodeled the house. You would think her situation was getting better, but she still had her challenges. Her ex continued to threaten her and made reports to child protection. This began an investigation which led to her and her family having to leave the house because it was ruled unsafe for the children. Not only that, she had a child that became suicidal so she stopped working to care for her child. Her children come first, so she lost it all again. Before long they were back in a shelter and she was back on public assistance. She cried for a night but still had the motivation to do better. She went by the office of Thor Construction, a minority owned business. A construction company she admired for their work. She went, although others tried to discourage her because of their strict reputation. Others said it would be hard to get a job with them. However, she was determined. She met with the Thor’s owner, Ravi and another executive, Martin and they took the time to ask her what she wanted to do with her life. 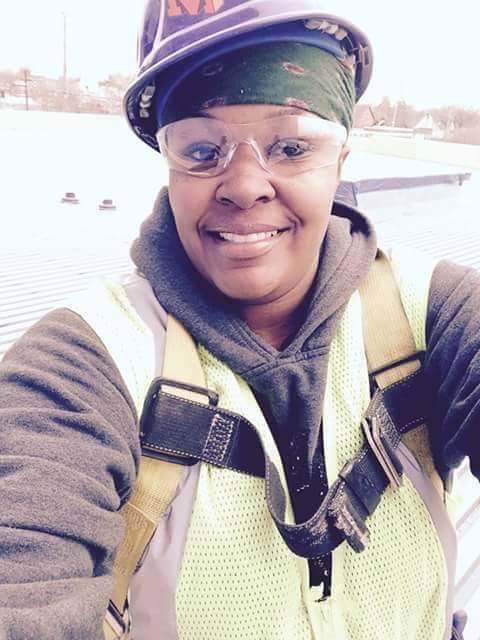 It took 4 months, but she eventually was offered the chance to work on the Vikings stadium. 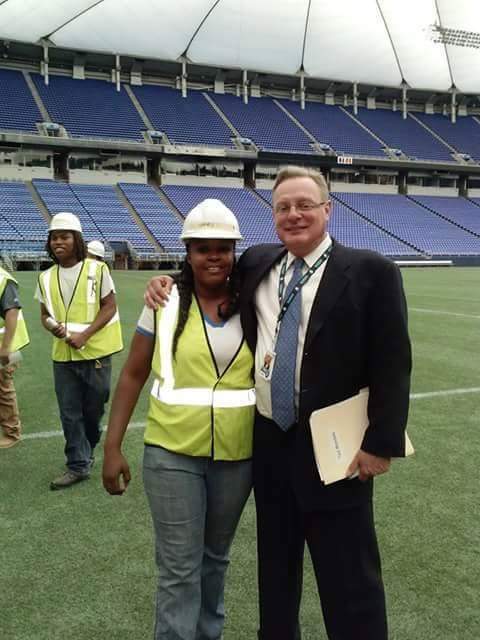 She remembers the exact day her stadium work began April 12, 2014 and she was also on the demolition crew in the months prior! It was still cold out in Minnesota, the wind was fast and the surroundings were loud and noisy. When talking everyone had to yell to be heard. It was unlike any other working conditions that she’d ever experienced. Plus, she was the only female carpenter on her crew and the only black female carpenter. She admits it was an intimidating environment. Not only did being female and black make it intimidating, the job itself was intimating. In addition to being accurate, she had to work fast. If her crew was behind, the whole project would be behind. 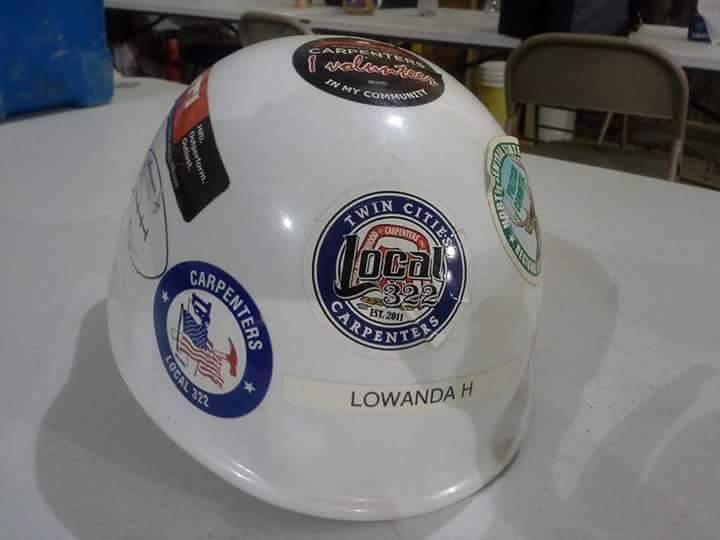 Lowanda was responsible for building the concrete forms (this is what holds up the stadium), pouring cement, cleaning, and helping the iron workers. Her role changed temporarily when someone snuck into the new stadium. Her crew was mandated to build a wall around the stadium because the reporter mentioned how easy it was to just push through a fence and enter the construction site. Here is the article by Scott Heins about the “illicit” tour of the stadium. When I asked Lowanda “what did you learn” from her entire experience. Out of crazy situation, there is a beautiful ending. Going to Summit Academy and getting trained was the best thing I did in my life. Pray and hope the best. I know God won’t put me through anything I can’t handle. People will try to kill your dream, but don’t let anyone break you. What is life like for Lowanda now? She said she still has her challenges but it is nothing she can’t handle. She has enrolled in University of St. Thomas’ Project Management certificate program. 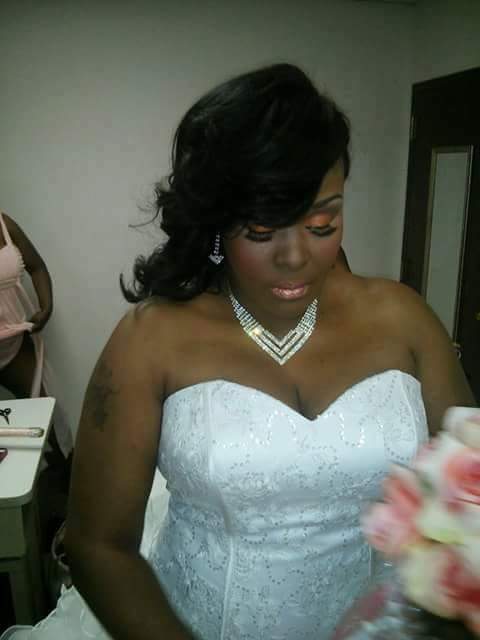 She has recently gotten married for the first time. To get ready for a successful marriage, she worked on herself and made sure the last relationship was out of her system. She also worked on being a better mom and for 2 years she didn’t do anything but work and come home. 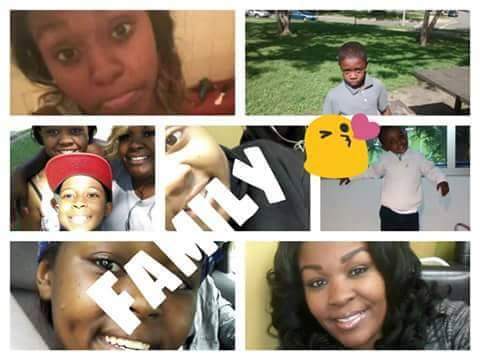 She didn’t think anyone would want her with 7 kids. Until her kids encouraged her to date again. 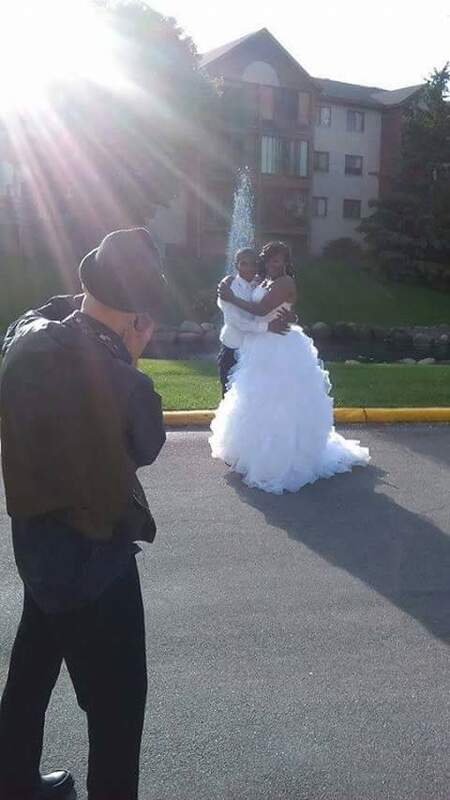 She finally said to herself, “I know who I am” and knew she was worth finding love again. 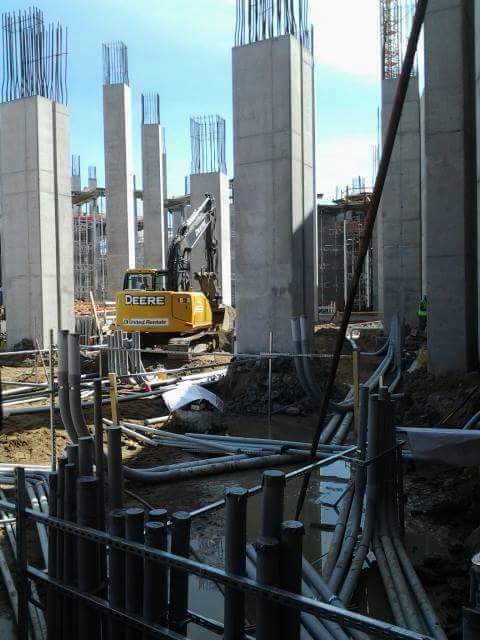 Watch the construction process live through various 24/7 cameras here. We are all waiting to experience the new stadium. Actually, if you can’t wait they are scheduling preview tours now until the opening in July 2016. Click here for more information. Previous Could You Live With Less Stuff? That is a hardworking woman. Inspirational story! Thank you Jacqueline, thanks for always being supportive. What a role model you are, Roxanne , for your children AND for all the rest of us!! I got what it takes . Because I have …..what it takes! Thank you Thomas, it’s one thing to see this pledge, say the pledge, and another to live the pledge. Especially, as a woman and that is why I honored her. Thank you for reading and instructing at SAOIC.